Within 15 minutes of my arrival at Villa Campestri, an olive oil-centric resort in the Mugello region of Tuscany, owner Paolo Pasquali was espousing his favorite theory over a welcoming glass of Prosecco at his 13th century home. Paolo believes that the restaurant business holds the key to olive oil education and that chefs can be the ultimate ambassadors of promoting quality extra virgin olive oil - provided they are incentivized by profit. Pasquali’s passion led him to create a way to protect the very best olive oil from degradation as it works its way from farm to table. 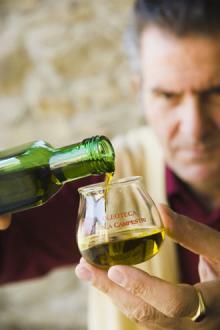 His program, OliveToLive, is designed to guard and guarantee the quality of oil until it reaches the ultimate consumer. A former philosophy professor and music enthusiast, his next project is to establish a new universal language for olive oil based on the harmony of taste. He’s the sort whose gentle demeanor can’t quite hide his fanaticism. Intense and resolute, Paolo reminds me of that line in an Apple Computer commercial from the 1990’s, “The people who are crazy enough to think they can change the world are the ones who do”. When my wife and I bought Villa Campestri in 1989, the property had only a handful of old, neglected olive trees. The terrible freeze of 1985 had decimated the orchard, like many others in Tuscany that lost thousands of trees that year. Along with farmers who had worked this land, we decided to harvest "the survivors ". But it was not enough to stop there, so we decided to plant 2000 more. Spending day after day in the olive orchard, I listened to the farmers who talked and talked about nothing but olive oil. I asked myself: Why is this so important to them? I'm still trying to answer that question. What do you think is the olive oil industry’s biggest challenge? It is crucial for the industry to begin to show some respect for this product which brings so much joy to our tables and so much good health to our bodies. Only when the industry itself develops that respect, that sense of honor, can it be communicated to consumers. The idea that it is possible to change things. With a few good ideas and the help of a small group of like-minded friends and colleagues, we can design a new approach to the olive oil market. Trying to move olive oil from cost to profit in the chefs’ world. Trying to shift the emphasis from what is often an expensive cost in a restaurant's cash outlay to the idea that restaurants can actually profit by offering a selection of oils for diners to sample and choose, at a cost that appears on the bill. No one expects to get free wine in a restaurant. Why then should they expect to get free high quality extra virgin olive oil? I'd like to see excellent olive oils handled with the same care, and the same sense of respect, with which wines are given. To have two wonderful daughters. Bread and olive oil. But not just any bread with any oil. Personally I think the fabulous bread from Altamura in Puglia, made with locally grown hard durum wheat and baked in a wood-fired oven is a perfect match with Tuscan olive oil but, very specifically, oil produced from olives grown in the hills up above 500 meters (about 1800 feet). Any place where you can smell the perfume of the air. It happens so often in the countryside of Sicily, and in Tuscany. At restaurant Monastrell in Alicante, Spain. Chef Maria Josè San Roman prepared a 12-course dinner with 12 different olive oils to celebrate the opening of Oleoteca Villa Campestri at her fabulous restaurant. It was a dream. To create a new, universal language for olive oil excellence so that farmers, oil producers, chefs, restaurateurs, food critics, food lovers, and the general public can learn and understand and evolve their comprehension of what this great and unique product means.